Baked Mongolian Chicken is the perfect combo of sweet and savory. 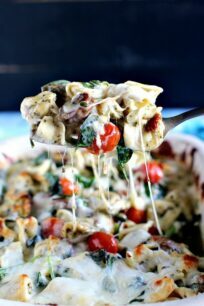 A very easy dish, made in one pan and baked instead of fried. 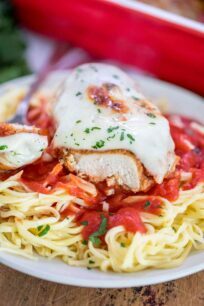 We love a good chicken recipe that is easy to make during a busy weeknight. 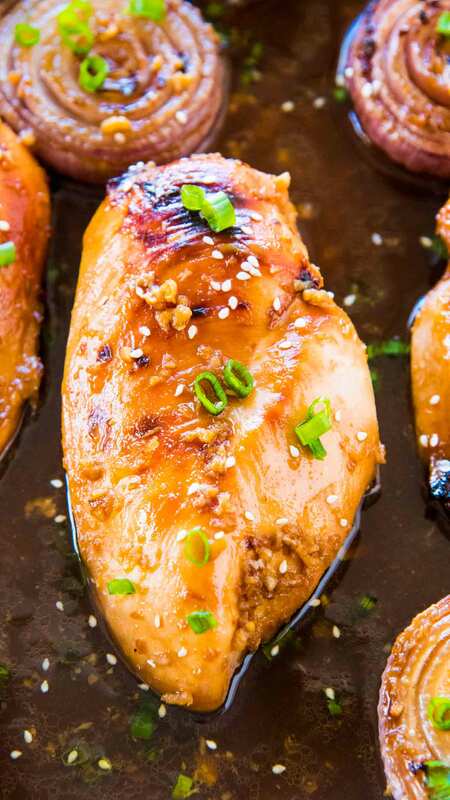 We have quite a large variety of them, like our popular Instant Pot Orange Chicken, Instant Pot Tuscan Chicken or Creamy Parmesan Mushroom Chicken. Baked Mongolian Chicken is easily made in one pan with just a few ingredients. You get all the amazing flavors of mongolian chicken, without any deep frying, which makes this meal so much lighter. Brown sugar and lots of garlic create the most amazing sweet and savory combo, just how I like it. The chicken can be marinated in the same pan, so it goes from fridge to oven. You can swap the chicken breast for chicken thighs if you want. I also roasted some red onions in the sauce, and they turned out juicy and very tasty. Served with rice on the side, this will become your go-to weeknight dinner! 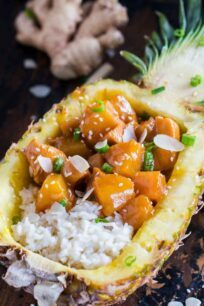 This Instant Pot Mongolian Chicken is one of my most popular recipes and it has rave reviews. I was getting so many requests to make a Baked Mongolian Chicken recipe, for those who don’t own a pressure cooker! Here it is, my friends, all for you! Firstly, it is easy to make and it takes only around 30 minutes! Also, only one pot to clean. In addition, it is perfect for busy weeknights and also for entertaining guests. You will have delicious left overs. Firstly, use organic chicken breasts or organic chicken thighs. Also, I left the chicken to marinate in the baking dish, you can also use a ziplock bag if you prefer. If you choose to marinate it directly into the baking dish, leave the dish on the counter at room temperature for 1 hour before baking. Because the chicken and the dish will be cold when removed from the fridge. This is very important, especially if you are using a glass baking dish. In addition, Mongolian Chicken is usually made with lots of brown sugar. However, I have reduced it here to 1/2 cup. If you prefer you can use less, but it will change the flavors in the recipe. If you don’t have fresh ginger on hand, use 1 tablespoon of ginger powder. But keep in mind that fresh ginger is more flavorful, so try to get some. Using red onions in the recipe is totally optional, but they are really good roasted in that sauce. I have used lots of garlic, as it adds such a nice flavor, if you are not a fan, feel free to reduce the amount. Serve over rice or noodles with steamed veggies on the side. Yes, follow the same recipe instructions, you will have to bake the chicken it a little longer for 20-25 minutes. 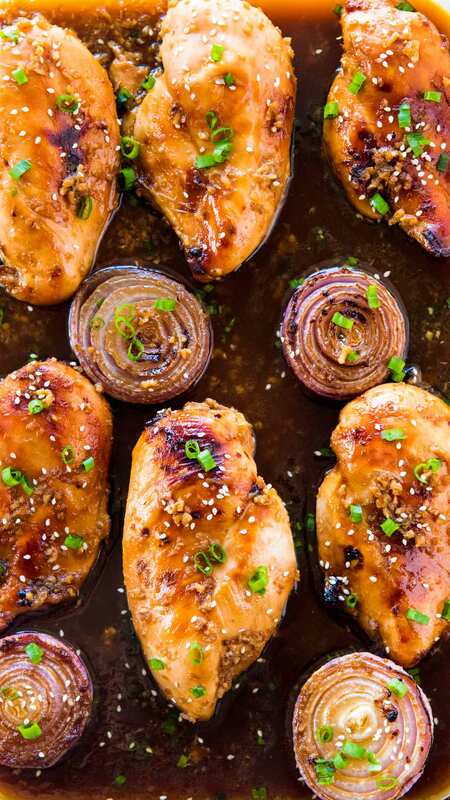 Oven Baked Mongolian Chicken is the perfect combo of sweet and savory. A very easy dish, made in one pan and baked instead of fried. In a medium bowl, combine all "Marinade" ingredients and stir until sugar is dissolved. Add chicken to a large ziplock bag, or lay it on a very lightly oiled baking dish. Top the chicken with the marinade. If you are using a ziplock bag, close it and place it in the fridge. If you are using a baking dish, cover it with plastic wrap and transfer it to the fridge. Marinate the chicken for 1-8 hours, make sure you flip it at least once during this time so it marinates evenly. If you used a baking dish, remove it from fridge and let it stay at room temperature for one hour, before placing it into the hot oven. If you used a ziplock bag, 30-40 minutes at room temperature would be enough. 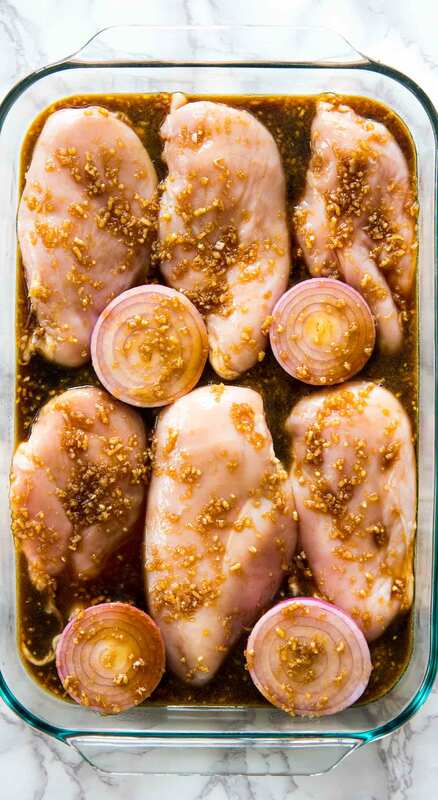 If you used a ziplock bag, add chicken to the baking dish and top it with the marinade. Add the halved onions to the baking dish. Baked uncovered in the hot oven for 15-18 minutes, or until the chicken is cooked through and no longer pink. If you use a cooking thermometer, the temperature in the thickest part of the breast, should be between 165-170 degrees F.
Using a baster or spoon, pour the sauce mixture over the chicken 1 or 2 times while baking. 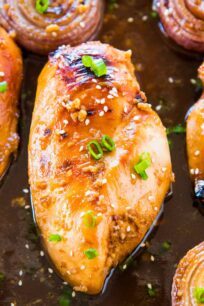 For a crispy, brown top, turn the broiler on high for the final 5 minutes and broil the chicken until it is cooked through and extra browned on top. Watch it closely, so that it does not overcook and/or burn. Slice the chicken and top it with a few spoons of sauce from the pan. Then serve immediately with rice and steamed veggies. The chicken can be refrigerate in a sealed container for up to 3 days, or freeze for up to 3 months.